Below: Free printable lunchbox notes that are perfect for the month of March! Includes St. Patrick’s Day themed notes. I’ve learned a lot about blogging in the four and a half years that I’ve been doing it. For example, I’ve learned that you should start your blog posts with an interesting story to draw the reader in. I’ve also learned a lot about human nature in the 35 years I’ve been alive. For example, I’ve learned that if someone clicks on a blog post to get a recipe, they don’t care about your interesting story because they just want the recipe. I’ve got awesome and free printable lunchbox notes for you today. They cover the whole month of March. There are 24 with messages and 6 that are blank for you to write your own messages. You can double print a page to make up for the extra day if you plan to leave notes on the weekends too. Just fill in your info below and you’ll be immediately redirected to the PDF. One more thing! If you print them out and start using them with your kids (or your spouse; they need encouragement too! ), why not snap a picture of the fun places you put them? A lunchbox, a notebook, a coat pocket… get creative! Once you take your picture, post it on Instagram with the hashtag #WordsKidsNeed (you can tag me too @ohhonestly) or post it on my Facebook page. If you’re interested in an entire year’s worth of printable lunchbox notes, plus other great printables, check out this resource pack. Want to go deeper with the notes and letters you send your kids? 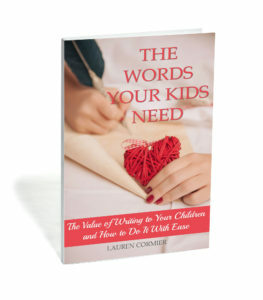 Check out my book, The Words Your Kids Need: The Value of Writing to Your Children and How to Do It With Ease.